Ataturk Airport has 3 major ways to reach the city centre and Taksim, which is the main area of interest for tourists in the city. Taxi, metro and bus are the three ways for you to reach the city centre area, however all (apart from a taxi) are less than straightforward. If you wish to take an Ataturk airport taxi, the journey will be around 45 minutes (in normal traffic) and will cost around 11€ (55TL). If you wish to take public transport, the metro is available for 0.40€ (1.95TL), but will require a switch of lines which will cost an additional 0.30€ (1.40TL). There is also a bus, however this is run by a private company named Havabus, and will only go to certain destinations. The bus takes approximately 40 minutes, traffic dependent, and costs 2.40€ (12TL). . The metro system in Turkey connects the Ataturk airport with many areas of the central city. Unfortunately, the route requires a switch of metro lines to get to the new city central area. The metro is around 10 minutes’ walk from the arrival area and is well signposted. 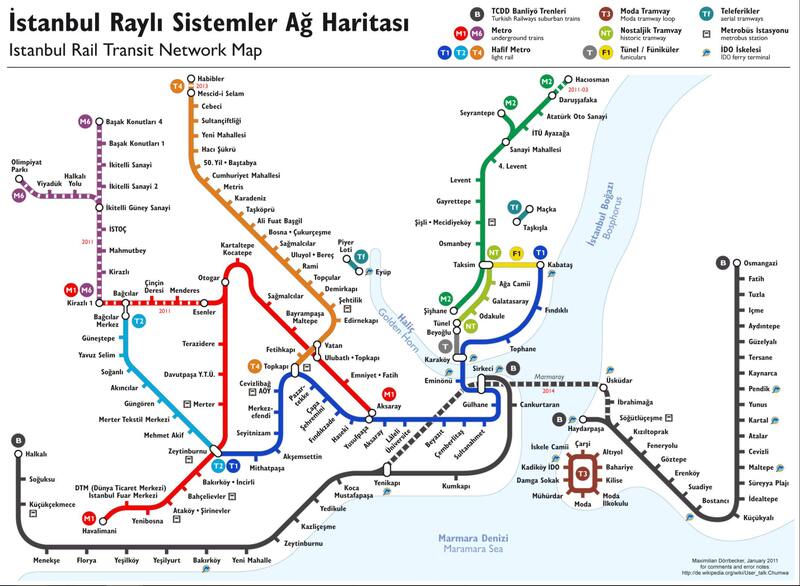 In order to reach the city, you will need to take the M1a line into Zeytinburu, then change to the M2 line for Taksim. The journey should take around 40 minutes by this method. How much is the metro from Ataturk Airport to the city centre? The metro takes 3 payment types and each price differs. Depending on which one suits your needs it can be quite cheap, or rather pricey. If you plan to utilise public transport a few times while in Istanbul (this includes metro, tram, bus and funicular) then it is best value to purchase an Istanbulkart, which is a re-loadable card that scans on entry – and includes a discount. The journey this way will cost 0.40€ (1.95TL), plus 2€ (10TL) for the card, available at the service counters in the airport. Otherwise, you can purchase a Jeton from the Jetonmatick machines, which are single use tokens. You will need two per person at a cost of 2€ (10TL) per person for the journey. Alternatively, you can collect a single use paper ticket from the Biletmatik, which is cheaper the more journeys purchased on it – for a single journey it will cost 1€ (5TL). There can be up to a 20 minute wait for the metro. The metro runs between 06:00am - 11:00pm and leaves from the airport every 15-20 minutes during these hours. From the arrivals lounge – plenty of signage and 10-minute walk from the arrivals hall. Although the metro is a very cheap option, it can be extremely busy during peak hours and therefore, a hassle with luggage and can be a long journey when switching lines to the city. The Istanbulkart can be topped up at machines at major transit points. Machines are in English, Turkish and German and can be used on many different transport options in the city. The metro can be very busy, and therefore unsuitable with large amounts of luggage. The Istanbulkart is the best value for multiple journeys – providing a 40% discount on regular ticket fares. Ticket machines are available at major transport destinations and convenience stores. If you wish to take an Ataturk airport taxi to the city centre, you will find the rank outside the arrivals hall. The taxis in Istanbul are yellow and operate 24/7 from the airport outside all the terminals and should get you to the city in around 45 minutes. The taxis in Istanbul are the source of many complaints from tourists as many have been ripped off in various manners – whether it be cash issues or unnecessary detours, so proceed with caution if you wish to use this method. The taxis in Istanbul are metered. Ensure that you only take the taxis sat at the rank – and make sure they clearly display a meter. The journey to Taksim in the city centre should cost around 11€ (55TL). Taxis are a convenient option, being 24/7 and available right outside the airport. Although comfortable with a lot of luggage, taxis can be rather notorious for overcharging and duping tourists. Be savvy, ensure that you have a general idea of the route and pay what is on the meter only. The best way to avoid overcharges is to pay by cash. Always have a variety of notes available, as taxis might not accept big notes, but will always have change for a 20TL note. Do not accept rides from people who approach you in the airport, only take taxis from the rank. Shuttle services may seem like a deal but can often be very expensive if your hotel happens to be the last one visited. Traffic can be extremely heavy on the journey into Istanbul, this can affect the cost if you take a taxi. If you feel more relaxed knowing that somebody is waiting for you, you may as well book a Welcome Pickups transfer. As soon as you arrive at the airport you will be greeted by your driver. He will be waiting for you at the terminal of your arrival with a sign that has your name on it. Your driver will help you out with your luggage and together you will make your way to the vehicle. While he is driving you to your accommodation, the driver can give you some tips and recommendations on what to do during your holidays in Istanbul. Our drivers are hand-picked and speak fluent English. No need to worry about miscommunication issues that you may face with the local taxi drivers regarding your destination. Relax and enjoy your ride. The bus service from the airport to the city centre of Istanbul is not part of a public run bus service, but rather operated by a private company named Havabus. Havabus operates a limited number of routes with limited stops. However, there is one such route between the Ataturk Airport and Taksim district in the city centre. The buses are white in colour. How much is the bus from Ataturk Airport to Istanbul city centre? The bus will accept either cash - Turkish Lira - 12TL (for Taksim journey) on the bus for a ticket or will accept Istanbulkart, which if purchased will earn you a cheaper ticket for the journey. Istanbulkarts are available for purchase inside the airport. There can be up to a half hour (30 minute) wait for the bus. The bus runs in the departure hour of international flights, leaving every half hour approximately between 04:00am - 01:00am daily. While the bus provides long hours and good storage space, the wait and cost compared to other transport options, as well as limited destinations means that this method is less convenient than others. Drivers should help you with your luggage if you approach them outside the terminal near the Havabus stop. Havabus is a pleasant option if you have lots of luggage as there is plenty of storage space on board. The bus is scheduled based on international arrivals - so any airport hold up could cause a wait for you. Check the route carefully - Havabus only goes to certain places around the city. How much is a taxi from Istanbul Ataturk Airport to the city? The taxi from the airport will cost around 11€ (55TL). However, the cost is metered and therefore traffic may affect this, as well as your chosen destination. How many transfer options are there from Istanbul Ataturk Airport to the city? There are three transfer options to get you from the airport to the central city; taxi, metro and bus. A taxi is the only way to get you directly to your hotel. How far is Istanbul Ataturk Airport from the city? Ataturk Airport is located 18.5km from the central city. The journey by taxi should take around 45 minutes in normal traffic.